Mike Kilchenstein and his family started RAMP Sports after Mike had spent three decades working in all aspects of the ski industry, including many years at Rossignol and the Roxy Alpine Division. His dream was to create a rider-oriented ski and snowboard company with more sustainable and eco-sensitive manufacturing processes and materials, all while making the skis more affordable and high-performance. 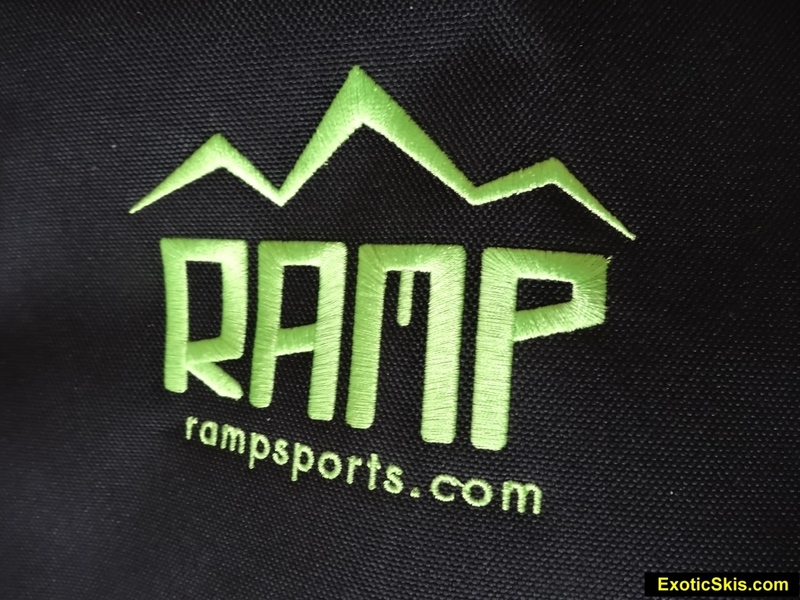 RAMP sports was essentially born in 2010 by outsourcing the produciton of original designs until 2012 when a new factory headquarters was built in Park City, Utah to produce their products in the United States. Since then, RAMP has won numerous industry awards and attention for its designs and business practices and become one of the success stories of startup ski companies. 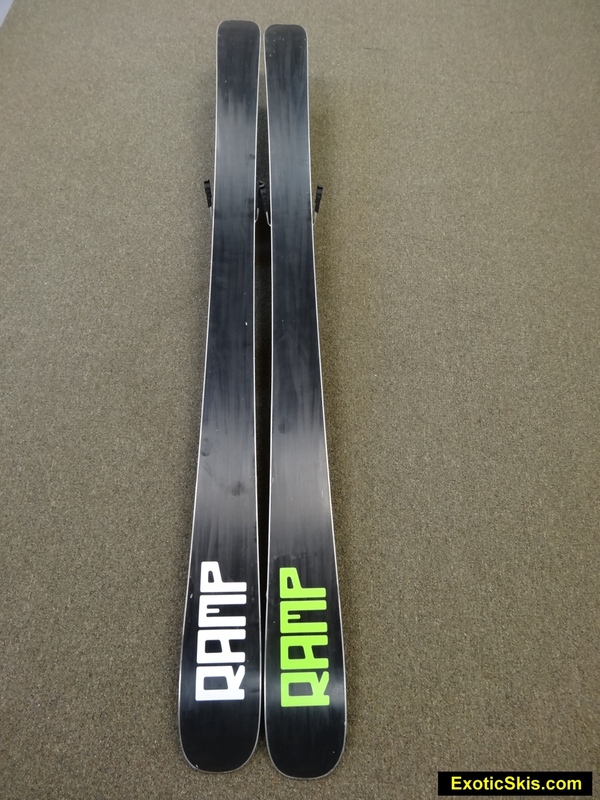 Agressive pricing, rapid prototyping R&D, grass-roots on-line and retailer marketing has brought RAMP onto the radar as a very interesting and active ski and snowboard company branching out into other products as well. "Getting the bird while hammering out high-speed groomers might be the norm, ah, but who cares cause flying is fun. But staying on-piste isn’t the sole purpose of this adventurous pecker. If it snows, the woods are home and a place to forage for that next meal of tempting treats in the trees. If that doesn’t whet an appetite, bouncing out a bump run will. The award-winning Woodpecker is the perfect choice for the skier who spends 65% of the time on groomers but likes to venture off trail, too. A 90mm waist is the best shape for versatility, especially when it comes to groomers, providing a catch-free tip that can hook up and carve like a race ski. With the 65%-35% Camber, the medium-minus early rise and reverse sidecut in tip, strong tail, and traditional camber underfoot makes this the go-to ride. The description of the Woiodpecker by RAMP is pretty accurate. The RAMP Woodpecker is one of the most versatile, easy-skiing frontside skis with a very high performance level available when driven, and can carve intensely on hardpack, yet remain playful and fun in mixed conditions. 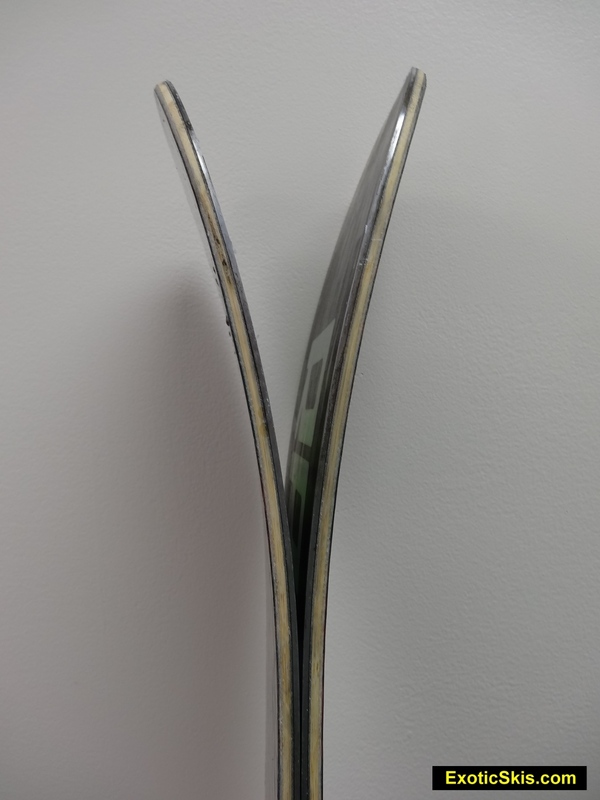 This is one of the nicest performing frontside skis we have reviewed since it is very easy to ski, yet can carve very serious arcs into hard surfaces at a variety of speeds and pressures and still handle fresh snow, bumps and cut-up surfaces with ease. Unusually wide performance envelope. 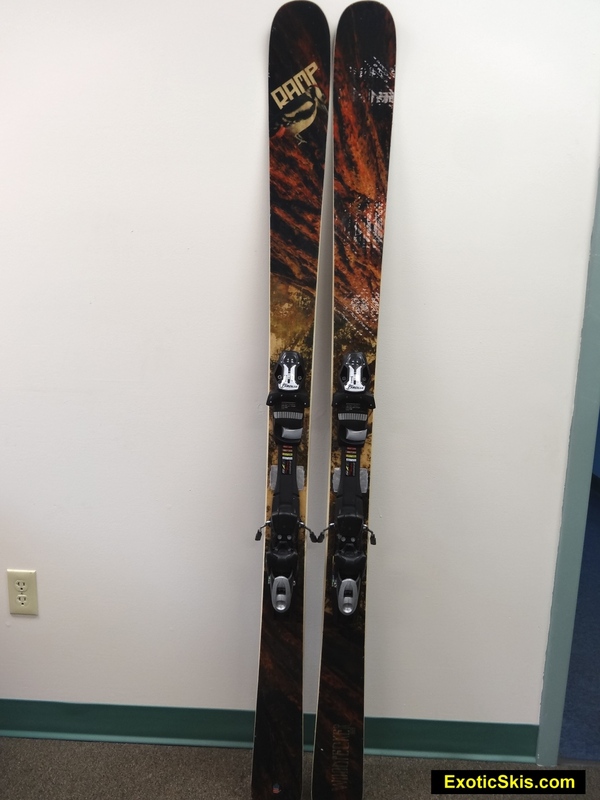 This 90mm waisted ski would be ideal for advancing intermediates to non-charging experts who spend most time on the frontside, but love to get out in the fresh snow on the frontside trails before the groomers mow it. Relatively soft tips and firm torsion underfoot with a very responsive bamboo core make the Woodpeckers lively, fun and easy to manage in the bumps and cut-up snow. Grip on hardpack and boilerplate is remarkably quick to engage, intensely grippy when asked and better than most skis in its class. It is not for hard-chargers or ticket-pulling GS+ speeds, but will make tons of people very happy. Add the binding and plate package deals, eco-sensitive materials and construction techniques and a "Made-In-The-USA" pitch, and you have a compelling product. The fit and finish were very, very good, and the transparent topsheet shows off the fiberglass laminate over the core nicely. Medium stiff flex, but round and even, with good rebound energy and vibration dampening. Torsionally strong underfoot, softer in the tip, strong in the tail. Early-rise tip (not really rockered). Moderate camber underfoot. Relatively flat tail. 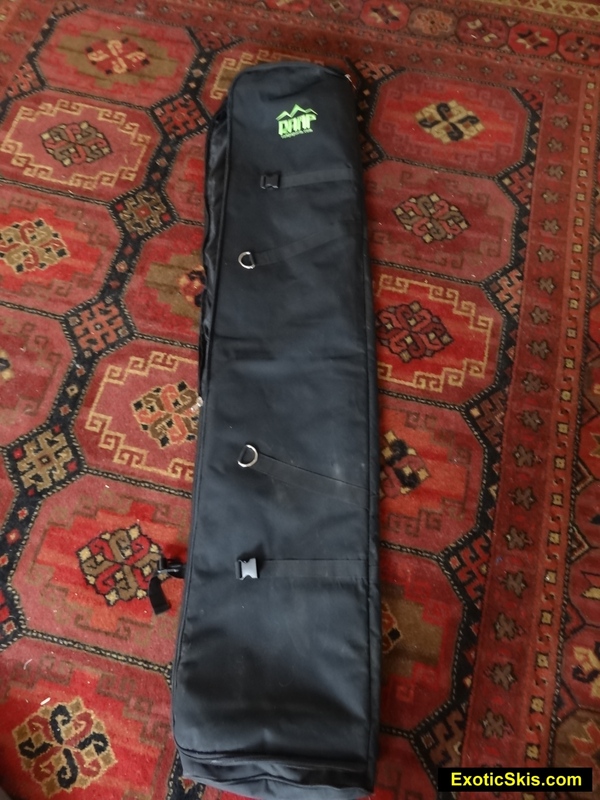 Instead of a cardboard box, RAMP delivers its skis to customers in a very nice padded travel bag for reuse. No need to recycle the cardboard box. Full-wrap edge all the way around the shovel (edge seam is on the tail). Embroidered logo on padded skibag included with RAMP skis. Eastern corduroy, packed powder and hardpack groomers with Eastern boilerplate, ungroomed packed powder with small bumps, shin-deep powder conditions, both smooth and bumpy. Windpack, crust, chalky wind buff, fresh and old powder. 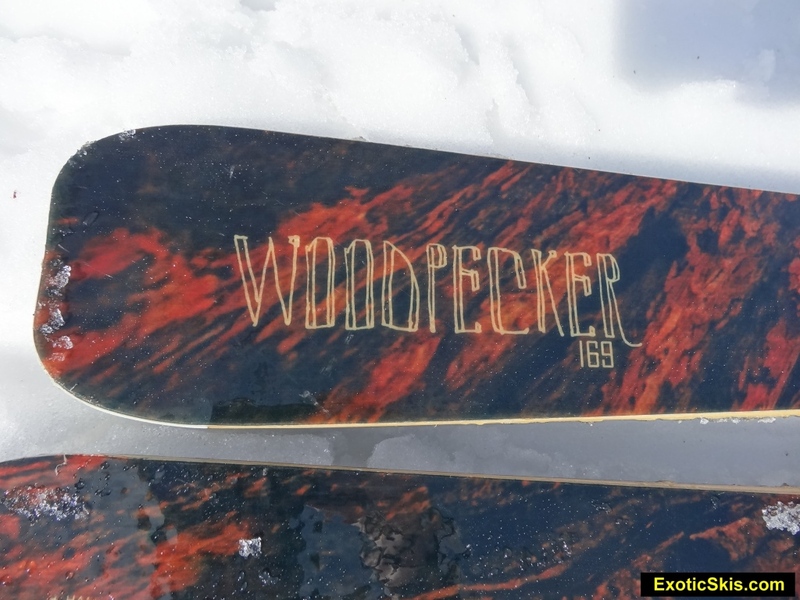 On our Eastern packed powder, hardpack and boilerplate, the RAMP Woodpecker looked (at first) like a mild mannered all-mountain ski with an early-rise tip and a nice birdie printed on the topsheet. Lay it over and pressure it, however, and you get an instantaneously gripping forebody that pulls the rest of the edge into the surface with authority and security, finishing off on a solid, strong and energetic tail acceleration into the next turn. I immediately felt myself going from "all-mountain carving cruising mode" to hip-dragging, "how-far-can-I-angulate-this-before-it-gives-out-under-more-pressure" mode. I was truly surprised at how much carving prowess this ski had, especially since it measures 90mm underfoot, but feels narrower and lighter than it should. The Woodpecker is fully capable of delivering a variety of radii of carved turns way tighter than its 19.5meter claimed rating would indicate...without any hint of protest. Some skis fight or want to straighten out or wash-away their tip or tail if over-turned, but the Woodpecker just keeps tightening up until you let it go. Very impressive. The vibration dampening was excellent on hardpack, excellent feedback telegraphed to the pilot without irritation. No negative behavior on hardpack at speed, other than a bit of tip flap at highest speeds and a slight eager-to-turn feel when trying to run flat bases at ticket-pulling speeds. Mixed conditions with the Woodpecker are handled very nicely with the early-rise tip and long-nosed forebody absorbing undulations and small obstacles with very little deflection, other than the crustiest surfaces, where the soft-tip can sometimes feel eager to change direction unless you maintain pressure in the center of the ski. Icy chunks can deflect the tips a bit, but generally they stay on-track without any effort. 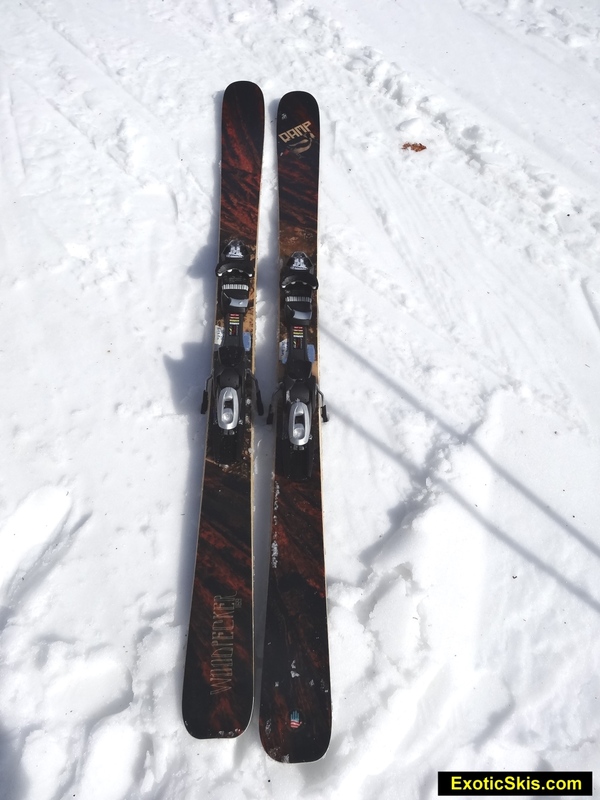 While the Woodpecker is not a hard-charging crud buster ski, it is very nimble and precise, rewarding the technical skier more than the muscle-head type of pilot in mixed conditions. This precision works really well when you want to traverse odd material densities and respond to the feel and feedback underfoot to adjust your pressure and weighting appropriately to maintain course. The Woodpecker responds very well to slight adjustments to alter its pressure into or on top of surfaces so you get as much or as litle bite and directional change as required...and that's a good behavior. The Woodpecker works very well when transitioning from packed conditions into fresh snow, then back again (like dipping off the side of the groomed trail into the fresh snow, then back onto the groomer...poaching small patches of fresh snow as it appears along the trailside). 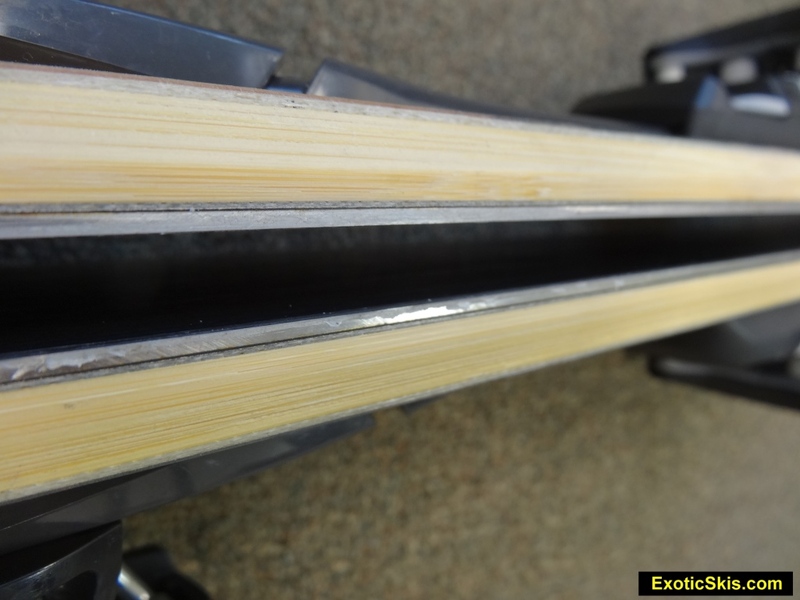 It's 90mm waist works well in all-surface frontside conditions, providing decent float when needed, and excellent grip on-edge when needed...all the while with a bright, energetic, responsive feel...sort of a trademark feel for RAMP bamboo skis. Sneaking into the tight trees is really fun with this ski since you can quickly shut it down to scrub speed (although not surfy like a fully rockered design), and nimbly change direction with its great grip underfoot and lively tail. Tip it on its side and pressure it into a tight turn, and it obeys and cranks right or left as you need...no hesitation. 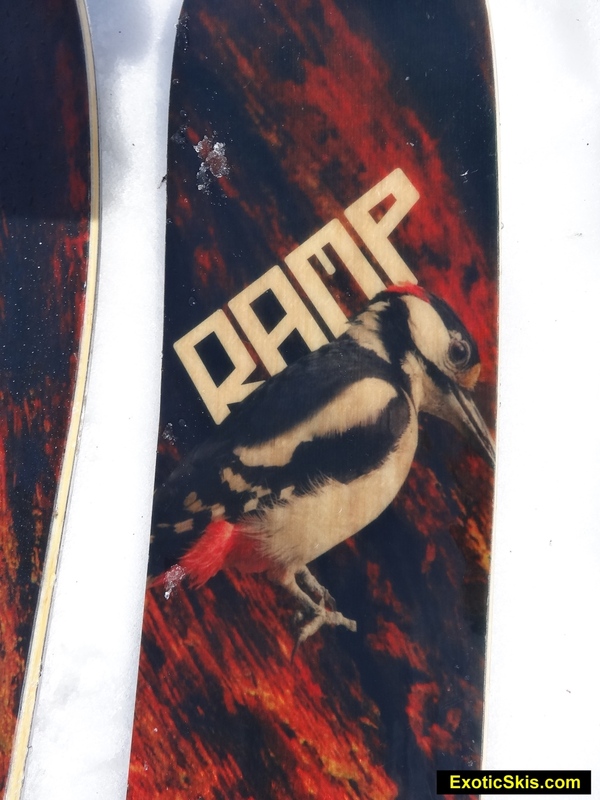 RAMP's Woodpecker is fun and totally friendly in the bumps, providing a more compliant, absorbing type of ride rather than the more rowdy, ejection-seat type of ride (like the Frenzy carving ski provides.). The early rise tip takes initial impacts with ease, gradually transmitting the bump pressure up the ski to the midbody where the snappy bamboo core flexes and releases quick energy when unloaded. The relatively rounded tails rarely, if ever hang up in the bumps, making snake-like routes throught he walls and troughs easy. The Woodpecker does not behave like a high-performance bump ski, but a high-performance all-terrain frontside ski in the bumps. People who previously had a more hard-core carving ski which abused them in the bumps will find the Woodpecker much more fun and playful in the bumps, while delivering great carving behavior when you get out of the mogul fields. Freeride bump terrain is effortlessly traversed, letting the skier take pretty much any track they want through undulating terrain without any hesitation or protest from the Woodpeckers. The Woopecker is agile and precise in powder, being more directional than floaty and surfy than some other 90mm waisted skis. You can regulate your depth and angles in three-dimensional snow easily, while usually feeling the ski is skiing somewhat shorter than it measures. This may be due to the relatively narrow tail, lacking an hourglass-like or wider shape to float the rear...preferring to sink a bit and give you the "front-end-up...rear-end-down" feel many people like in powder. 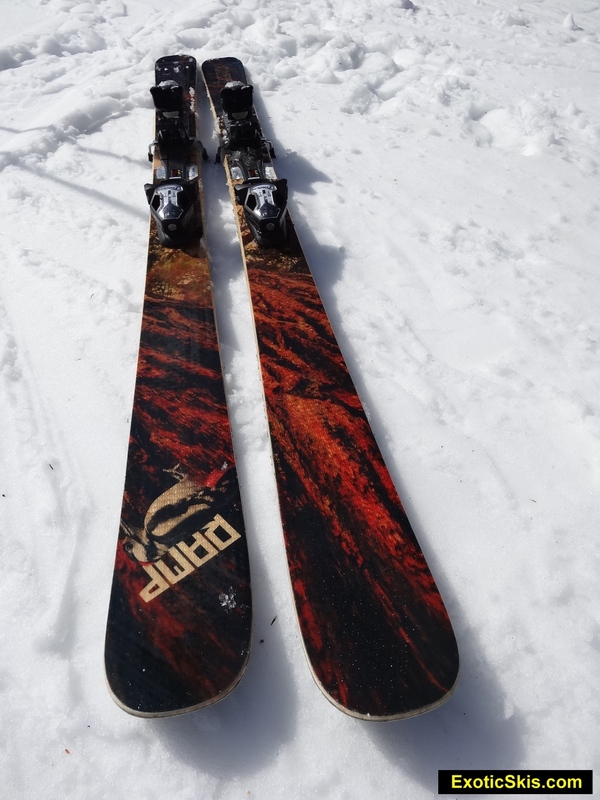 Compared to some other skis in this class such as the SkiLogik Rave TT, the Woodpecker is more groomer-oriented than powder-oriented. Since it delivers such a surprising groomer-grip, it's little wonder the powder personality leans toward a more directional feel. An apparently mild-mannered, friendly trail horse which is actually a champion barrel racer when unleashed...capable of astonishing the rider who doesn't expect such a high-performing ride in an unassuming package. Silky smooth turning behavior on groomers, mixed surfaces and slope angles. Stunningly good grip and radius variety on demand. Able to take surprisingly strong pressure in high-G carving situations without ever giving-way. Smooth, rapidly engaging forebody leads to confidence-inspring grip and fun acceleration. Very quick edge to edge when asked. Easy personality, deep and wide performance envelope. Impressive after getting off some other skis in the same category. Great frontside ski for someone who wants something more adaptable than a pure racecarver for all-surface frontside conditions. Superb carving behavior, yet light-handling and nimble in lots of conditions. Very wide performance envelope. If you are a heavyweight or athletic muscle-head type of skier, you might find the Woodpecker too soft. If you want a one-ski Eastern quiver solution, put the Woodpecker on your demo list. Add a dedicated powder ski to the Woodpecker in your quiver, and you should be all set in the East. Several companies provide discounts or donations to support our ski testing program. We can choose any poles. We choose Leki. They never fail & last for years. Halti is our choice to stay dry and warm when testing in Nor'Easter storms. 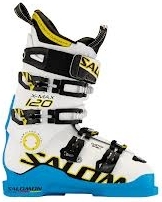 Boots are the most critical element when testing ski behavior. We can choose any boots. We choose Salomon. Green Ice Wax is our choice for non-fluoro, eco-friendly waxes. Smith is our choice for head and eye protection. 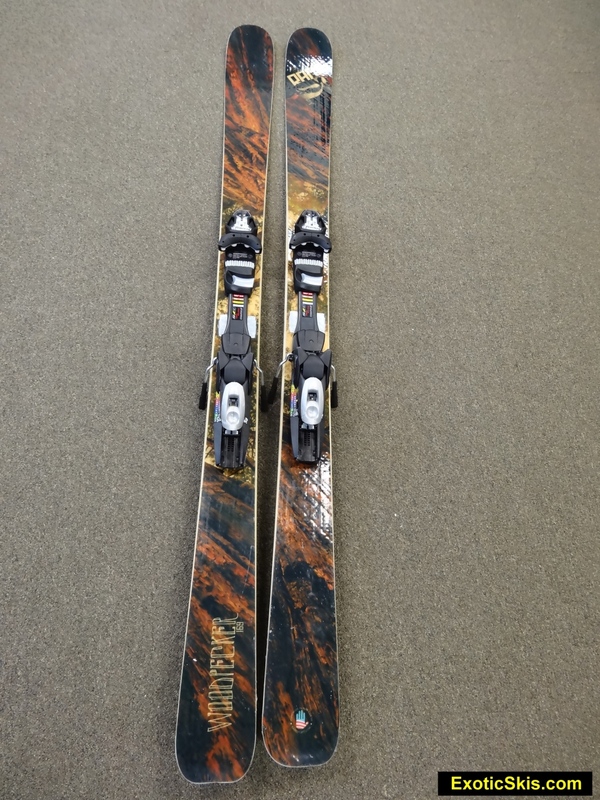 Northern Ski Works is our choice for shop work and bootfitting.